The Honors Program provides undergraduate students with a unique opportunity to work on an in-depth written or multimedia piece over the course of an academic year. After completing The Beat JOUR-201, students take two courses—Honors Advanced Reporting JOUR-UA 351, followed by Honors Senior Seminar JOUR- UA 352—for a total of 8 credits. 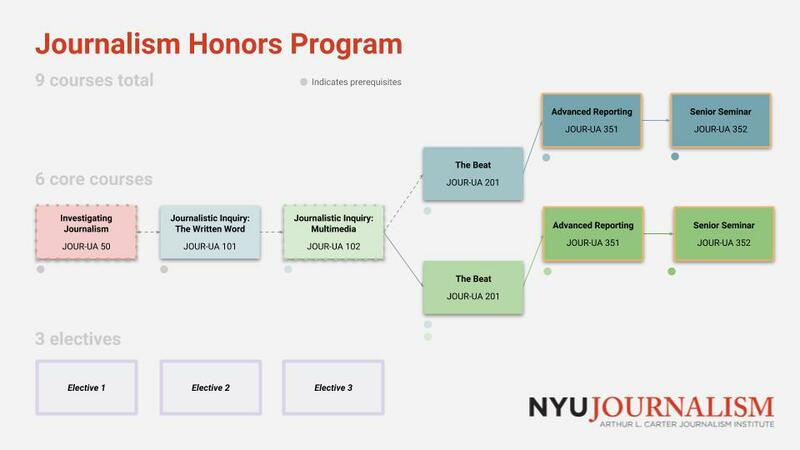 Students who pursue the Honors Program complete 9 courses in total, as opposed to the 8 courses normally required of journalism majors. Honors students benefit from close collaboration with a professor as they work to produce a long-form piece. Currently, Print/Online Honors courses are taught by Professor Brooke Kroeger, whereas Broadcast Honors courses are taught by Professor Jason Samuels. To be eligible for the Honors Program, students need to have a 3.65 GPA overall as well as a 3.65 in the journalism major. The Undergraduate Student Advisor, Andrea Brown, will contact students with GPA’s around or above 3.65 during the Spring semester to share additional information about how to participate. Currently, Honors Advanced Reporting and Honors Senior Seminar are only offered in the Fall and Spring, respectively. Students must be able to take Honors Advanced Reporting in the fall of their senior year and Honors Senior Seminar in the spring of their senior year. The Honors Senior Seminar course does not count as one of the three electives required for the journalism major. It is simply an additional course required for participation in the Honors Program. Students participating in the Honors Program may take a maximum of 40 credits in journalism.